This week has been a particularly nasty winter week so I thought it would be a good time to follow through on one of Cheryl’s recent kitchen requests: bake some bread. While looking at my favorite bread cookbook, Carol Field’s Italian Baker, I came across a pretty low maintenance recipe for an olive bread, Pane di Chiavari. Chiavari is a town on the Ligurian coast of Italy near Genoa and according to Carol Field there are wonderful olives in this area which give this bread its distinctive color. 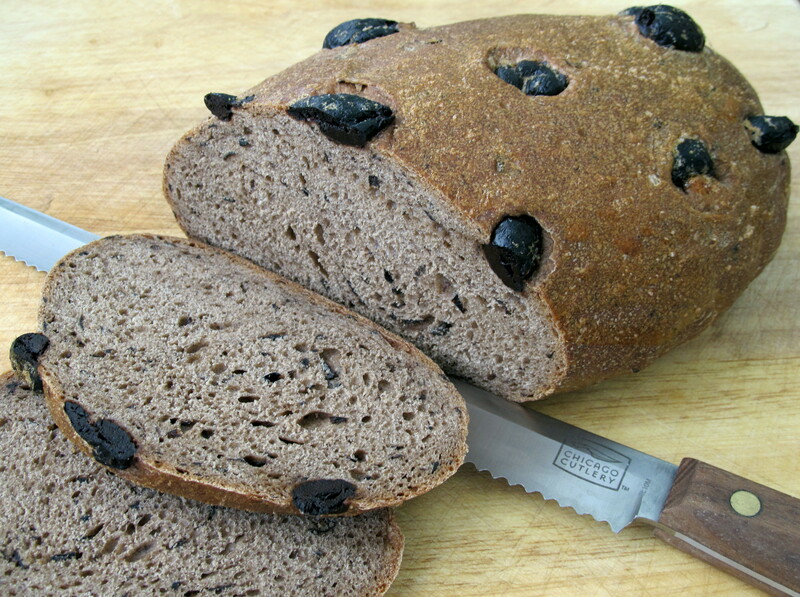 One attractive aspect of this olive bread recipe is it makes just one loaf. This is very appealing to me since a lot of the recipes in the book are for 2 or more loaves so if I want to make a single loaf I have to perform all this math. Yes, dividing by 2 or 3 is real hassle when I’m getting into bread mode. Another reason to like this olive bread is it doesn’t require a starter (a huge plus in my opinion) and you can have a fresh loaf of bread in about 3 hours. No math, no starter, bread in 3 hours. The secret to this bread is the olive paste. It gives the bread great flavor and a purplish color. Carol Field describes the paste being made from olives which are salted and herbed then mashed and allowed to sit for months. I did not want to wait that long for a key ingredient so I made my own. 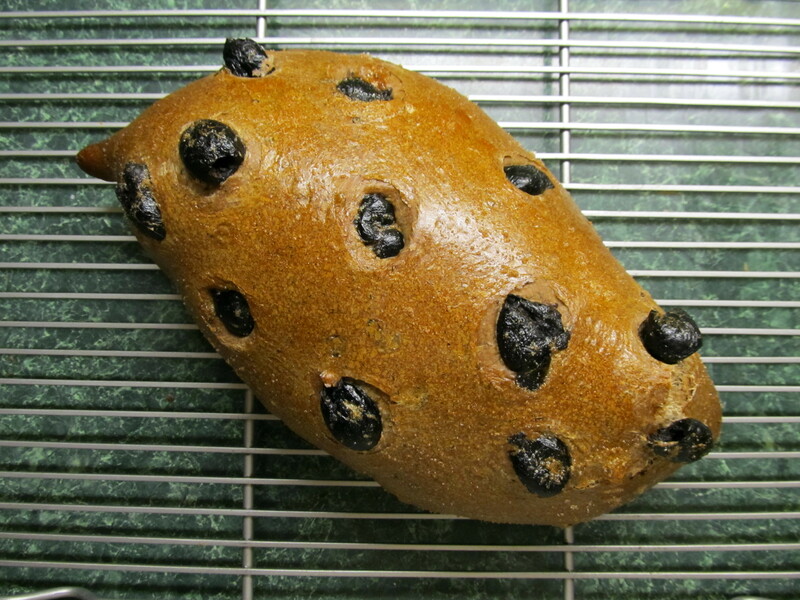 I used the black, oil-cured olives (pitted!) you can probably find in the olive bar at any grocery. They’re the shriveled up dried-out looking ones. Do try to find these because I think they’ll make a better paste than the brined ones. They are also saltier which I think better matches the flavor profile of the Ligurian olives mentioned. For the ½ C of paste needed I pulverized about 8 oz of olives in a mini-processor. Usually baking bread vexes me because I can never seem to get the result I want, there’s always something imperfect. This time however, I was happily surprised. The olive bread came out of the oven meeting all expectations! It didn’t burst anywhere, has a good taste and smell, the crumb has a nice sponginess to it but not overly dense, and a great color. It’s a real live bona fide olive bread like you’d find in a trattoria. It reminds me of this olive focaccia I’ve had at one of our favorite Italian restaurants here in Chicago. Bottom line is this recipe gives you a really good olive bread. And I have no idea how I baked it so perfectly. See? Vexing even when I get it right! In the mixing bowl, stir the yeast into the water. Let stand until creamy, about 10 minutes. Stir in the olive paste and mix well. Mix the salt into the flour and slowly stir into the yeast/olive paste. Mix well with the dough hook and run mixer for 5 minutes until the dough comes together, is smooth and elastic. Hand knead on the counter for a couple of minutes to finish if you like (I do). First rise – place dough in a lightly oiled bowl, cover with plastic wrap and let rise until doubled in size, about 90 minutes. Shaping and second rise – remove dough from bowl, punch down and shape into an oval pinching and twisting the ends in opposite directions so it looks kind of like an olive. Place on a piece of parchment paper, cover with a towel and let rise until doubled, about 45 minutes. Push the whole olives into the dough and brush with the egg white. Slide the dough on parchment paper onto baking stone and bake for 10 minutes. Reduce heat to 400°F and bake for 30 more minutes. Cool on a rack. A beautiful loaf of bread!! Thanks! I never make good looking bread (good tasting, yes) but this one turned out great. Hey now, what’s the matter with the way it looks?! Ha ha! That’s a really good idea for the ‘decorative’ ones on top. I guess I just didn’t push some of them far enough into the dough and they popped right up. Well, that was rude. In any case, I’ve never heard of olive paste. I guess you could just process your own olives – maybe leaving it not perfectly smooth so you see and taste the little bits? I can’t wait to try this! thanks!!! Yup that’s pretty much what it looked like. It’s a really good bread recipe!